Demanding rights for nuclear workers. Credit: National Union of General Workers. TOKYO, Mar 11 2013 (IPS) - Japan has promised to scrap the crippled Fukushima nuclear reactors that faced the world’s worst nuclear accident. But Hiroyuki Watanabe, councillor in Iwaki City located 30 kilometres from the accident site, greets such intentions on the second anniversary of the disaster on Monday with misgiving. “I see problems in Fukushima increasing, not decreasing. One of the biggest issues facing the country is the lack of qualified workers in Japan who can meet the enormous challenges ahead,” he told IPS. Iwaki City lies in Fukushima prefecture, and was affected badly by the triple disaster – earthquake, tsunami and nuclear accident – that struck on Mar. 11, 2011. The city is also host to J-Village, a former soccer field now the entry point to the zone around the stricken nuclear plant. Around 3,000 workers commute daily from the new base camp to work on the damaged reactors. They change into radiation protective gear before boarding special buses that take them to their work place almost an hour away. Watanabe says he must fight for the rights of these workers who spend eight hours daily in dangerous surroundings. Watanabe, a member of the Communist Party in the Iwaki local assembly, is not alone. The increasingly difficult looking road ahead as Japan struggles to deal with the damaged reactors has led labour unions to launch separate organisations to take up the issues faced by nuclear workers. Keiji Watanabe, general secretary of the National Union of General Workers, said there is an urgent need to create a strong protection base for the nuclear workers. Dismantling the plant could take up to four decades. “The grave situation in Fukushima as well as possible accidents in other nuclear plants in Japan demands the work of tens of thousands of men and women in the decades ahead. This unprecedented situation has awakened us to the dire need to set up units that can deal with the emerging labour issues,” he told IPS. A major grouse among labour activists is the lack of clear rules for nuclear workers. 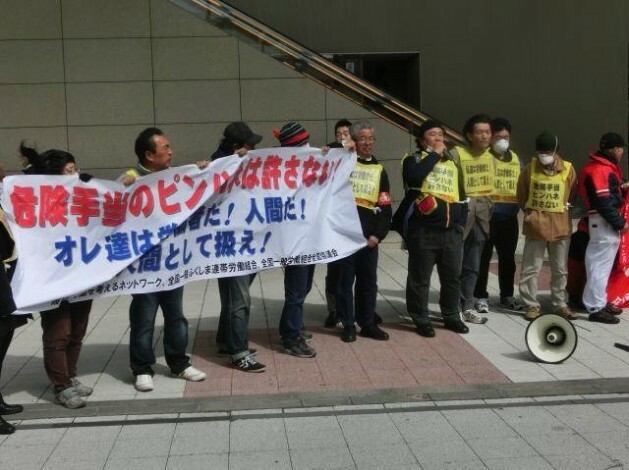 Currently the workers, divided by skill ratings and age, are employed by hundreds of subcontracting companies that have contracts with Tokyo Electric Power Co (TEPCO), which operates the Fukushima plant. Several workers hired by companies have raised their voices against the system of “commissions” by temporary employment agencies. About 90 dollars a day are added as special allowance to the salaries of temporary staff hired to clear contaminated debris and carry out repair work. But, said Hiroshi Goto who worked in the Fukushima Dai Ichi reactor, they face up to 50 percent deductions by the employers. “This cannot be tolerated,” he reported in Sekai, a leading Japanese monthly magazine. He said workers are helpless in demanding better conditions from TEPCO. Pressure from activists has led Japan to register stricter national contamination standards. Such conditions, labour activists say, would lead to a scarcity because many Japanese workers will have to leave their jobs to protect their health. Difficult employment conditions have already resulted in a rapid drop of workers willing to work in Fukushima. Watanabe from Iwaki said the majority of the 3,000 working at the reactors are local people from Fukushima who lost their farming jobs because of the contamination of their land. “The majority of the workers are older people who need jobs to survive,” he said, and this could mean that Japan has to import workers to meet the looming crunch. Against this backdrop, conservative Prime Minister Shinzo Abe has declared that the nuclear reactors will be restarted for some time once their safety has been confirmed in order to provide the country with stable energy supply – 30 percent of the national energy supply is dependent on nuclear power. In the meantime, almost 60,000 Fukushima residents remain dislocated from their homes with no prospect of returning due to the decontamination work. “Two years after the Fukushima meltdown, we are still looking for answers to pave the way forward. The situation continues to be a nightmare lesson for Japan,” said Watanabe.